Hitting the water at Sanctuary Cove International Boat Show, 24-27 May, two southern hemisphere firsts that will wow the crowds – the JetLev and JetSurf. Visitors to this year’s boat show will be astounded at the high-tech gear on show, in live demonstrations that will run daily, at 10am, noon and 2pm in the demonstration area of Marina C Arm. Imported from Germany, the JetLev from Jetpack Adventures can reach 10 metres in the air (30 feet) – the height of a three storey building! Water is pumped from a jetski like device up a large hose to the Jetpack unit. Up to 4000 litres of water a minute can pump through the jetpack. That would empty a household pool in 10 minutes! Powered by a petrol 4 stroke motor / 250 horsepower or 190kw, it can carry a person up to 150kgs. Solid, yet light, the Jetpack is made of carbon fibre and has an inbuilt throttle on the handle like a motorbike that allows it to hover, go backwards and turn on a dime, up high or down low. It has a 5 point safety harness similar to a racing car and Pilots can and will perform hands free at times as the jetpacks are so stable. The Jetpack has a safety lanyard stop/start like a jetski and you can place your hands in the water jets without being hurt. Chief pilot, Jack Ellison was the First person in Australia to fly the Jetpack. Jack is renowned for his Water spectaculars worldwide, as well as Darling Harbour NYE celebrations, Red Bull Air events and Australia Day events using fireworks and lasers on Jet skis. More at www.jetpackadventures.com.au or phone 1300jetlev. 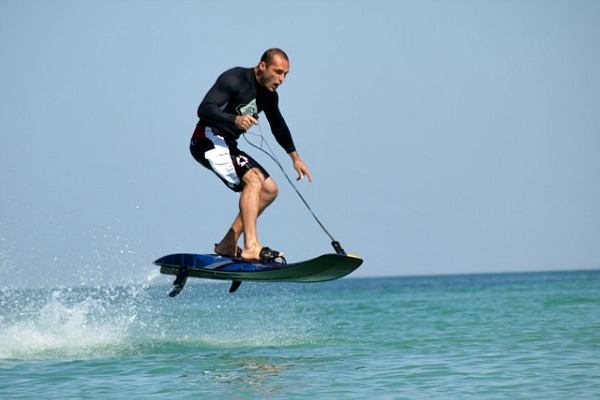 From Dubai, the Jetsurf is a motorized surfboard designed and manufactured by MotoGP and Formula1 engineers. Totally unique, it is a monocoque hull made 100% from the highest quality carbon fibre. A specially designed high tech Two-Stroke 86 cubic centimeter engine provides an amazing 55Km/h with only 14kg in weight! JetSurf is equipped with an automatic electronic control unit with auto start function and a system for continuousness running of the engine. Power to the starter motor and spark plug is supplied by 3 Lithium Ferron batteries. Digital charger is included for charging these batteries.